Boy Scout Troop 355 member Matthew Ryan Hideo Wong, 17, recently received the rank of Eagle Scout, the highest rank in the Scouting program. Matthew is a senior at San Marino High School and a member of the varsity basketball team. He also played for the Pasadena Bruins basketball team for eight years. He is the son of Ken and Ann Wong and the grandson of Haruto and Marian Miyataki. 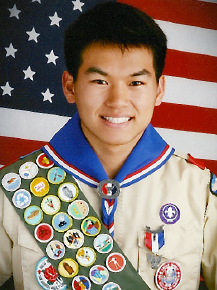 His older brother, Kevin Wong, earlier attained the rank of Eagle Scout. Matthew began his scouting career in the fall of 2004 when he joined Cub Scout Pack 354. He earned the Arrow of Light in 2008 and crossed over into Boy Scout Troop 355 in San Marino. He was an active member of the troop and served as patrol leader, instructor, assistant patrol leader and historian. Throughout his years with the troop, he experienced many memorable outings, including camping at Cherry Valley on Catalina Island, river rafting on the Kern River, and kart racing and bicycling 50 miles in the Solvang Century Ride. For his Eagle Scout Project, Matthew refurbished wooden building boxes for the San Marino Community Church Nursery School. The boxes have been a part of the pre-school classroom for many years and were in need of care. He selected the pre-school for his project since he attended the school and recalls playing with the same building boxes as a student. With the help and support of his troop and friends, he successfully completed his endeavor.